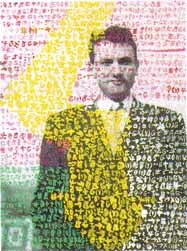 Born in Rumania in 1928, Isidore Isou came to Paris at the end of WW II with many ideas for a renovation of all the arts, a re-visioning from the ground up. He called himself a "Lettriste," a movement of which he was initially the only member. But others soon joined him, and the movement continues to grow, albeit at times under a confusing number of different names. In the 1960s, Lettriste and Lettriste-influenced works gained a great deal of currency in France, and associated with the Situationist branch of the Anarchist family, became the art that dominated posters, barricades, even clothing in the attempted revolution of 1968. Although it seemed a highly self-contained art in the post-war period, in 1968 it suddenly became more deeply involved in active social change than such movements as Existentialism and Surrealism, and came closer to producing actual transformation than these movements. Today, many Anarchists see the Paris Spring as the last nearly-succesful attempt at putting their ideas into practice, and this historic moment still holds a strong aura for many lefties. The Lettristes themselves, however, don't look back. Guy Debord, one of the most visible of the group, split with it to a large extent because of the way he could not move beyond the celebrity of this time. Perhaps most important to the Lettristes is the need not to be held back by something that has passed. It would be particularly unfair to younger Lettristes to be trapped in a movement that was in turn a prisoner of past glories. Catherine James, a Lettriste featured at this site, for instance, had not yet been born in 1968. At present, Isou himself, in poor health, continues to work with great determination in his studio - looking back, yes, but not at a particular moment, and not in such a way as to slow himself down. The most immediately striking feature of Lettrisme as a form of visual poetry is its extensive use of calligraphic techniques and the invention not only of fluid letter forms, but of new and ever changing letters themselves. This can move into surprising areas, such as painting directly on cinematic film and then projecting it as a movie. And it can extend into everything from furniture design (see particularly Alain Satié's work elsewhere at this site) to architecture. Lettrisme always carries the individual artist's personal hand, the workman's most basic signature, in all its productions, providing not only a critique of industrial society but suggestions for humanizing it. From its early stages, superimposing letters on various objects, and on other letters, has been important, and the art has at times been called hypergraphie. In many surprising ways, it foreshadowed layering and other computer techniques that hadn't yet been invented, and even characteristics of world wide web graphics. Lettrisme had a far-reaching influence on the visual poetries of both Anglo and Latin America, often travelling through underground channels. A major deseminator for the art in North America was d.a.levy, who inroduced it to me, as well as the great Canadians, bpNichol and bill bissett. In many instances, it joined with the heritage of Kenneth Patchen, growing from there into the work of such varied poets as Joel Lipman and Carol Stetser. In Latin America, it came as a welcome relief from the rigid, brittle, dogmatically geometric and beligerantly minimalist work of the Noigandres group. You can see one Latin chanel emerging in the work of Clemente Padin at this site, as well as the work of such different inovators as Edgardo Antonio Vigo, Graciela Gutierrez Marx, and Avelino de Araujo. Perhaps most insistently, it helped shape the freedom of mail art, which grew up along side it, and shared some of its basic premises. And perhaps most curiously, contemporary graffiti writing, probably the most dynamic visual poetry of the 90s, shares many of Lettrisme's basic characteristics, from graphic design principals to revolutionary orientation, even though graffiti artists can't by the wildest stretch of the imagination be seen as influenced by Lettrisme, and Lettristes and graffiti artists probably would have little to say to each other directly. Still, French graffiti, often oriented toward Lettrisme, was one of the essential tools of the attempted French revolution of 1968. Lettrisme has made its way through many European movements, from the bewildering thicket of Italian isms to looser incorporations in the Russian Samizdat revival of Zaum, in the work of many Hungarians, and particularly in the large and varied body of work of the Signalists in Yugoslavia. Some European visual poets who went their own way show strong affinities with Lettrisme - Constantin Xenakis being one whose work shows clear Lettriste influence. In addition, some Lettristes left the group and continued practicing some of its principles - but that's a story too complex for this survey. More information on Isou will be found here in the future, and these brief notes simply serve as a temporary introduction. Stay tuned for this and, in the meantime, check out the work that's here already. Michel Amarger and "La Marche des Jongleurs" - Theater Piece by Isidore Isou. Comment by David Seaman based on Isou's score and Amarger's production notes. Photos and Notes by David W. Seaman. Return to Lettirste Pages Main Index.